First it was the news that Frank Miller is making ANOTHER sequel to his legendary graphic novel The Dark Knight Returns. Disney shareholders, be of good cheer. Your Marvel Cinematic Universe need not fear any competition from DC. I wouldn't cosplay that if my life depended on it. And Frank "I'm the Goddamn Batman" Miller should be banned for life from doing another Batman title. EVERYTHING about how this Joker looks is wrong!! A friend said we should give Jared Leto a chance. 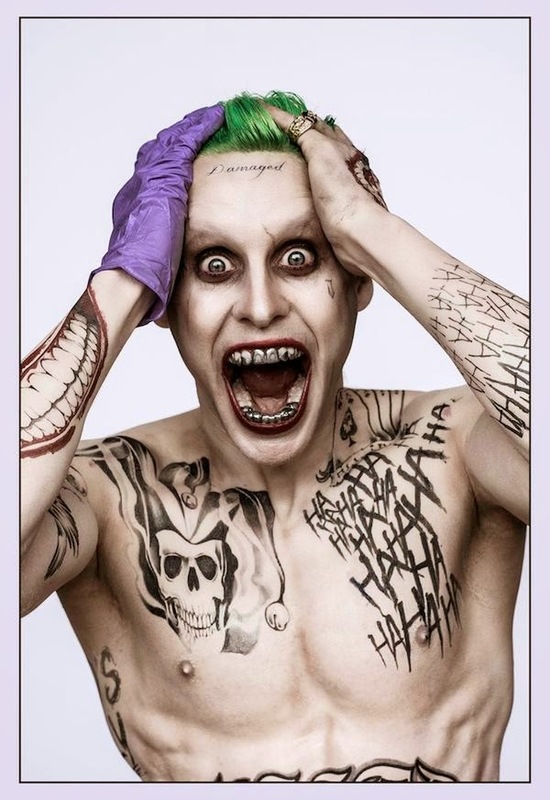 It's not Leto's skill that I am questioning... but I do wonder what the hell they are smoking at Warner Bros. Studios if they think that this is the Joker. You just DON'T get to drastically alter the Joker. He is too ingrained into our pop culture. He is simply too iconic. Not even Heath Ledger's Joker, and the various liberties they took with him, was a radical variation from the comic version especially the very earliest appearances of the character. It would be like giving Darth Vader a flaming gold lame cape instead of the black one. Or putting Vito Corleone on a diet. NOBODY does those things to those characters. And you don't get to do that to the Joker either. The Joker is crazy. We know that already. We don't need "DAMAGED" tattooed on his forehead to get the point.